With our family having so many school and extracurricular activities, it’s hard to keep the house neat and tidy, especially the kids’ rooms. It seems that it’s an endless chore to have them pick up toys, put clothes away and actually have room on their bed to sleep. Give rewards for keeping their rooms clean. 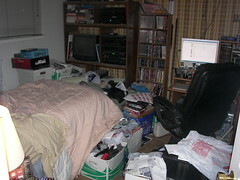 We give the kids an extra 15 minutes of video game or TV time if their rooms are kept clean. It doesn’t happen very often, but then again…their kids. Make sure that the kids have a system for putting away their clothes. When I fold their clean clothes, I separate them into how the kids need to put them away (i.e. all socks and underwear together, shorts together, pants together, etc.) This makes it easier for them to bring a “pile” of clean clothes to their rooms and dump it into one drawer. Regular “clean-outs”. Schedule to do regular clean-outs of the kids’ rooms. If you wait to do it once a year, it becomes a bigger issue than it really should be. Plus, lots of the unused toys will become broken or have lost parts over time, which keeps you from being able to do # 5 and 6 on this list. Keep brand new toys and clothes for garage sales or Craig’s List. How many times have your kids gotten toys that they NEVER used, still unopened in the box? And how about that sweater with the tags on that got pushed to the back of the closet? I just found one of those yesterday, ugghhhh! I hate waste, but you can sell those unused toys and clothes for a premium on Craig’s List, or a garage sale if you’re not sure how Craig’s List works (google it). Doing the “GREEN” thing: I make sure that any usable toys and clothes are saved to be given to charity. I would recommend putting small parts in plastic baggies. I know plastic isn’t “green”, but how else can you keep those little pieces and parts together? ome. I don’t have enough fingers or toes to count how many times I’ve tried to give that poor lonely GI Joe to a better home, and the kids stop me saying that it’s their FAVORITE toy! Organize the toys into labelled bins. This helps the kids keep the mess off the floor because they know where everything goes. For example, we have bins in their rooms labelled “Hot Wheels” and “Action Figures”. Anytime they find a Hot Wheels car, they know which bin it goes in when it’s time to clean up. Keep toys with parts in their own bins or baggies. One of big issues is keeping the toys with pieces and parts together. If they have all of the pieces in one big bin, they’ll never find THAT sword that goes with THIS action figure. It leads to frustration and the toy doesn’t get played with. And worst of all, the toy ends up staying on the floor. Get toys that aren’t “clutterers” that keep the clutter off the floor and in the “play zone” where they should be. This is what I’m working on now, and plan to buy Hot Wheels Wall Tracks for the boys for Christmas. I hope these tip help you get those bedrooms and playrooms under control. I’ve implemented most of these tips already, and the rooms look better. Not completely uncluttered, but much better than before. And now I’m off to the store to get some of those fantastic Hot Wheel Wall Tracks to get their cars off the floor! Disclaimer: “I wrote this blog post while participating in the SocialMoms and Hot Wheels® blogging program, for a gift card worth $40. For more information on how you can participate, click here.” Although I’m participating in a blogging program, all thoughts are my own.